Our Hood River home is right downtown. 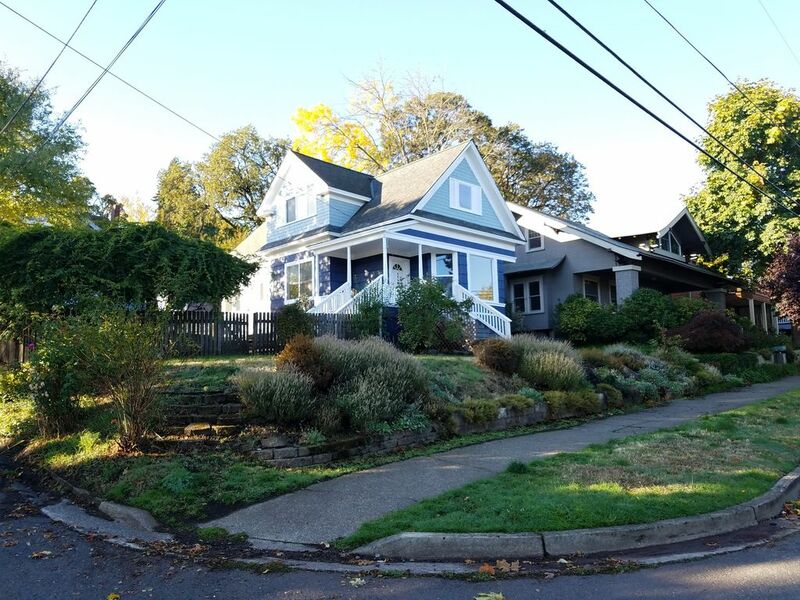 We bought this 1905 home for its ideal location and charm. It's an easy two minute stroll to shops, cafes, breweries, wine bars and galleries. And of course, the immediate access to world class windsurfing/kiting, skiing, mountain/road biking, skateboarding, kayaking, rafting, fishing, hiking, climbing, hunting and fruit picking. The house has four bedrooms (3 up, 1 down) with super-comfy memory foam mattresses to ensure a great rest; a comfortable living-room with some river/mountain views; a fully stocked kitchen and a large fenced-in patio for outdoor lounging and dining. We are a family of 4, mom dad and two teen girls; avid windsurfers who live in Portland. We enjoy sharing our home and the fun of HR with friends and guests. We love the Gorge. We bought our home in Hood River after years of Gorge van camping. With two kids we wanted a bit more 'civilized' and we saw this place said: we could enjoy this home for the rest of our lives. And that's our plan. Been windsurfing since 1978, still out on 3.0 days and hope to be in 2038! First, Hood River is a fantastic place to be. This community has friendly, energetic and caring people; amazingly rugged beauty; tons of activities and sports to enjoy; and its sunny a lot more than Portland! Second, our home is well located right in the village; in the middle of town, easy to walk around and yet quiet. Third, its a great old home- a comfortable place to kick back and enjoy a vacation. Full kitchen with service for 16+. Fenced yard/patio. Driveway level with first floor and first floor has bedroom & bath (not ADA). We had a great time in Hood River and the house was exactly what we were looking for. Location was great and house was well equipped. Perfect place for a family and friends get away and very kid friendly. I can't say enough good things about this rental property and its owner! Mitch was SO easy to communicate with and he offered awesome suggestions of things to check out during our stay in Hood River making it obvious that he loves Hood River and its community :) The house itself was absolutely perfect for our stay! We had 3 couples total who each got a bedroom and everyone said how comfortable their beds/bedrooms were. The fact that the there is a fenced in yard made it easy for our pup to run around while we hung outside at night grilling and enjoying the neighborhood. Also, the location! It was soooo close to downtown Hood River! We walked everywhere! (except the beach/river). We hope to make this a ritual and come back every 4th of July week! Thanks again, Mitch!! A group of 3 ladies attended a tax convention in Hood River. Staying in a house together was the same price as 2 hotel rooms where the convention was and gave us more space. The house was within walking distance to restaurants (and ice cream) and a quick 5 min drive to the event. Mitch came buy and checked on us and was really nice and friendly. No issues with the house. We would stay there again for certain! Excellent. Very clean. Very functional. Location was the very best part of this property. Close to all of Hood River’s breweries, but just nestled in a neighborhood to feel like home. Plenty of room to have the entire family at your gathering. Comfortable sleeping arrangements and no cramped feeling. Beautiful outside space. Owner was very friendly and helpful. Even had activity suggestions for our trip. Will be back! Awesome Space - Perfect for a big crew! We are frequent travelers to Hood River and Mitch was able to provide an amazing place pretty last minute. Four excellent bedrooms, 2 bathrooms and enough seating space inside and out for all of those people to grab dinner/BBQ. Large yard made it easy to dry out and sort gear. Highly recommended.